In addition to the usual credit card options, you can also make secure payments using PayPal! PayPal is a fast and safe way to send money and make online payments. Adding balance to your UpCloud account using PayPal is quick and easy. One of the benefits of using PayPal is the many payment methods they support such as Visa, Mastercard, American Express, and more. However, the payment method accepted by PayPal may vary depending on your region. You can always check their supported countries and regions on their website. In this guide, we explain the steps to make a payment using your PayPal account or the PayPal guest checkout. Refer to the following documentation about other accepted payment mechanisms and general information about adding balance to your account. To add balance to your account using PayPal, start by logging into your UpCloud control panel and going to the Billing page under your Account. 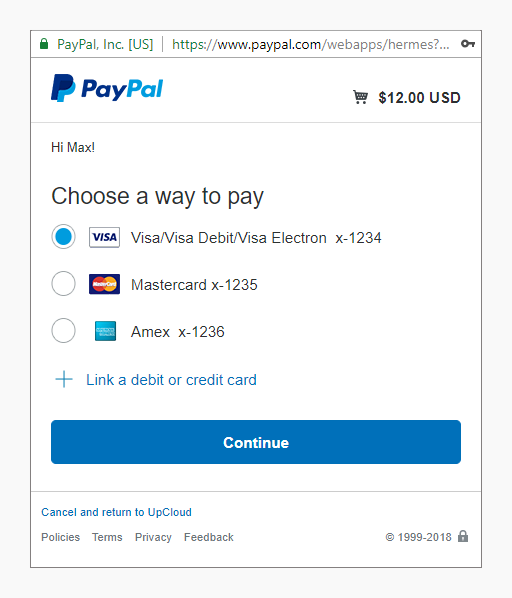 In the Manual one-time payment section, select PayPal as the Payment method. 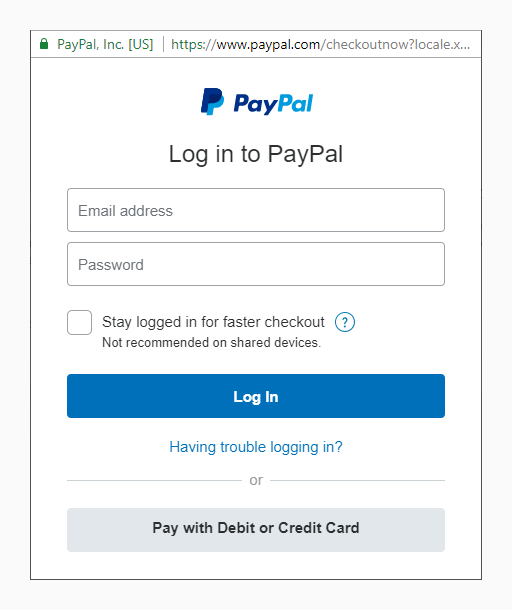 Once selected, you will see the familiar PayPal Checkout button. Next, click the PayPal Checkout button. This opens the PayPal interface in a new window. Then follow the instructions below to complete the balance transfer by either signing into your PayPal account or by proceeding as a guest without an account. Continue by logging into your PayPal account. Once logged in, you will see the payment methods you have saved on your account. Choose the payment method you want to use. You can also add a new payment method to your PayPal account by clicking the plus sign and following the displayed instructions. When ready, click the Continue button at the bottom to confirm the selection. In the next screen, check that the transaction details shown are correct. If everything is in order, confirm the payment by clicking the Pay Now button. Once the payment has been processed, the PayPal window will close. You will then see a confirmation notification of the transaction at your UpCloud control panel and your new account balance. Each payment will show on the Payment history list. You can also download previous invoices from the Billing page for your own records. If this payment was your first time adding balance to your UpCloud account, your account will then also have been upgraded for full access. Optionally you can use PayPal Guest Checkout without an account. Start the guest checkout by selecting to Pay with Debit or Credit Card at the login screen. You will then be directed to the PayPal credit card form for guest checkouts. After entering the required information, click the Pay Now button at the bottom of the window to confirm the payment. The payment will then be processed. When completed, the PayPal window will close. You will then see a confirmation notification of the transaction at your UpCloud control panel and your new account balance. The funds have then been credited to your UpCloud account and are ready to be used as you wish. If this payment was your first time adding balance to your UpCloud account, your account will then also have been upgraded for full access. 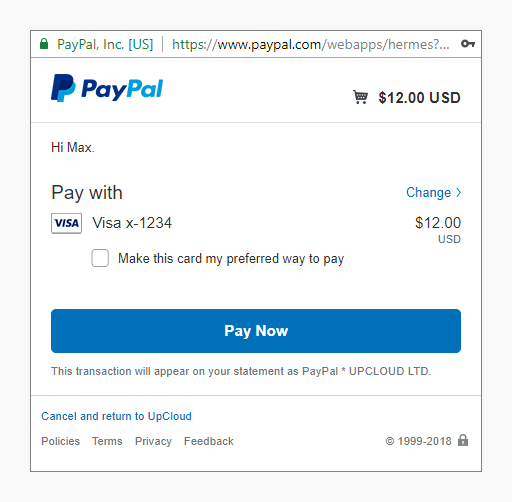 Although adding balance to your UpCloud account using PayPal is easy and convenient, it does, however, include some limitations. Only one time transfers are supported using PayPal. Configuring a recurring payment still requires using an accepted credit card. The funds are credited to your account in USD. If you are using a payment method in another currency than USD, PayPal will handle the conversion according to their exchange rates. Thanks for reporting the issue, we’ve fixed the pics!